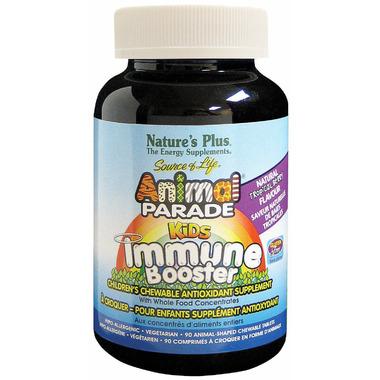 Animal Parade Kids Immune Boost offers customized immune system support, specially designed for kids' delicate nutritional needs. These irresistibly delicious chewables feature a proprietary blend of vitamins A, C, E and zinc combined with whole foods, green tea and olive leaf. Acidophilus further supports peak immune system function while promoting a balanced digestive environment and optimal nutrient absorption. Best of all, kids will flip over the fun animal shapes and luscious tropical berry flavor, bursting with fruity goodness! Non-Medicinal Ingredients: Sucrose, d-fructose, natural raspberry flavour, microcrystalline cellulose, cranberry fruit extract, stearic acid, magnesium stearate, Stevia rebaudiana leaf, citric acid, maltodextrin, calcium phosphate, tribasic, L-malic acid, magnesium hydroxide, silica. Free from artificial colours and preservatives. Free from the common allergens yeast, wheat, soy and milk. before or after taking other medications, antibiotics or antifungals.